FM Fire-Safe Shutoff emergency block valves prevent or thwart catastrophic losses. Too frequently small accidents become major losses when fuel continues to flow in an emergency situation. When used correctly, these FM Fire-Safe Shutoffs keep hazardous materials from entering an area with an existing fire, saving major losses, and possibly even lives. Fuel is required in various parts of a processing plant and is distributed to the multiple areas. Fuel lines are typically located out of the line of traffic, to prevent damage from moving equipment and activity. If proper precautions and safety designs are not adopted, this fuel line can spread fire started in one area throughout the entire processing facility. 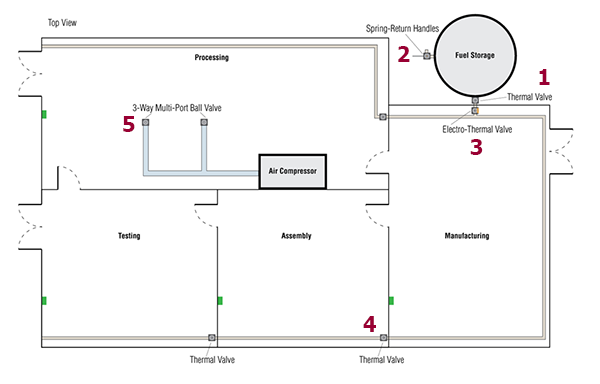 The accompanying process diagram illustrates a solution used by many of our customers. Note that the fuel storage tank is kept outside the building wall, and fuel is distributed throughout the facility on the inside of the wall perimeter, keeping the fuel line clear from activity and traffic. Any fire started in the center areas of the building would need to spread from its initial ignition in an area of high activity towards the wall perimeter before the fuel lines are exposed to the hazard. Beginning at the fuel tank, fuel isolation is designed as a multi-stage redundant process to prevent the spread of fire from one room or area to another. The fuel tank has an FM Fire-Safe Thermal Shutoff, which engages when temperatures outside the perimeter wall rises past the trigger point. This serves to isolate the fuel, preventing entry into the building if a fire ignites at the outside tank. That way, the fire cannot spread along the fuel line to the interior of the building. The tank is equipped with another thermal shutoff equipped with a spring return handle to allow samples to be taken from the tank. If a fire ignites while fuel flows through this portal, the FM Fire-Safe thermal shutoff will stop the fuel flow, preventing wider spread of fire.Spring handles are installed as a safety device to prevent the valve from being left in the wrong position or to ensure someone is supervising the use of the assembly while in use. The spring handle ensures that the valve will close automatically once the operator releases the handle. Note that there is no thermal link on a spring handle. An FM Fire-Safe Electro-Thermal Shutoff is placed on the main fuel line directly inside the perimeter wall. This shutoff is activated by temperature as well as fire detector systems. A fire or smoke detector network that is placed throughout the entire facility can be wired in to the FM Fire-Safe shutoff to completely stop the flow of fuel from the external tank into the internal distribution lines.The FM Fire-Safe Electro-Thermal Shutoff also engages when the temperature reaches the thermal trigger level inside the building — even without an electrical signal from the fire or smoke detector network. In this way, if the fire is located near the shutoff and has not yet been detected by the fire or smoke detectors, the shutoff will still stop the flow of fuel. Continuing throughout the facility on the distribution lines, there are FM Fire-Safe Thermal Shutoffs placed in-line in every room or area. If a fire occurs in one of the ancillary rooms, the thermal shutoff will halt the flow of fuel at that point. For example, in the design depicted in this diagram, once the temperature rises to the trigger level in the assembly area, the fuel is stopped before it reaches the testing area. Fuel will still be available in the manufacturing area and processing area until the fire gets to a point to trigger a smoke or fire detection network, which then will cause the main FM Fire-Safe Electro-Thermal Shutoff to engage and halt the flow of fuel into the entire building. The final placement of FM Fire-Safe emergency block valves is at the air compressor and surrounding equipment. The air compressor secures the lines with 3-way multi-port valves. By employing these 3-way shutoffs, the airflow is stopped as soon as the temperature rises above the actuation level of the shutoffs and the air line to equipment is vented so any spring assist actuators can close. This protects the down side equipment from further damage when fire is present, as the air compressor will not introduce further oxygen to the fire as an accelerant. Brian Booth is Vice President of Sales at Assured Automation, a leading provider of Automated Valves, Flow Components, and Fire Safety Products for industrial process control applications for over 30 years. Assured Automation provides state of the art automation ranging from small equipment manufacturers to the Fortune 500 Manufacturing, Chemical and Pharmaceutical Companies. The Assured Automation product line consists of a complete offering of standardized automated valve assemblies with a variety of commonly used accessory items. In addition, we offer complete valve automation services where we supply special automated valve assemblies designed around your specified products or your particular applications. Full design capabilities are offered including AutoCAD, Solidworks or other commonly used design and drawing programs. In addition to standard products, Assured Automation develops customized solutions for specific customer requirements. This entry was posted in Biofuel Industry, Emergency and Fire Safety Valves and Devices, Latest News, New Product Announcements and tagged Fire Safety. Bookmark the permalink.